The truth was everything to Gareth Jones. The Barry-born Welsh investigative journalist led a short but highly eventful life that ended in his murder in the wilds of Mongolia in 1935 aged 29. It was the price he paid for his reportage in Communist Russia and Nazi Germany in the 1930s, as he selflessly helped expose one of the gravest crimes against humanity the world has ever seen. Unravelling the ultimate legacy of Gareth Jones has only just begun. In his lifetime his work was cruelly discredited by other journalists, jealous at his connections and incredulous that the gravity of what he reported could possibly be true. 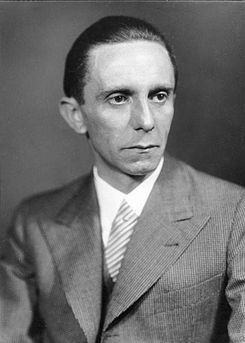 Jones’ picaresque career includes the time he shared a plane with Adolf Hitler and Joseph Goebbels in February 1933, hours after Hitler was made Chancellor of Germany. Jones later interviewed the Nazi propaganda minister after a hysterical, 25,000- strong rally in Frankfurt. He also became a personal aide to former Prime Minister David Lloyd George, aged only 25, and was once photographed alongside shamed US president Herbert Hoover outside the White House. Jones could also count the wife of Lenin and American newspaper magnate William Randolph Hearst among his interviewees. Nigel Linsan Colley, great nephew of Gareth Jones and the person who’s done more than anyone to Welsh investigative reporter Gareth Jones believed in the truth. In the early 1930s, he travelled through Nazi Germany and Stalin’s Soviet Union recording the grim realities of nascent dictatorships. “I think these diaries were destined to resurrect Gareth’s memory,” Colley says of the pencilled notes found in a dusty old suitcase in the house of Jones’ elder sister in Barry in 1990. “I think even [when he wrote them] he understood how important they would one day become. Jones’ diaries are on display until next month in the Wren Library at Cambridge University’s Trinity College, where he was once a student. Colley says there are no firm plans to hold an exhibition of Jones’ work in his native Wales, but the day is surely inching closer. 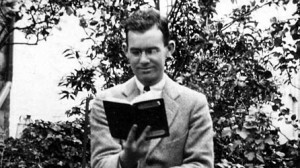 The National Library of Wales in Aberystwyth, which already houses many of Jones’ documents, says it has no immediate plans to hold an exhibition of his life and work. But the interest in the journalist’s work will reach a new level when Ukrainian director Sergey Bukovsky’s documentary about the Holodomor, The Living, gets its Welsh premiere at Cardiff’s Chapter Arts Centre in January. Wales, Aberystwyth in 1926 with a first class honours degree in French he went on to Trinity College Cambridge in 1929 and gained the same result in French, German and Russian. His talents quickly earned him an internship. Jones’ close association with Lloyd George’s Liberal Party in the early 1930s was the making of him. and 1933 that he uncovered a genocide being inflicted on the Ukrainian people by Stalin’s Five Year Plan. 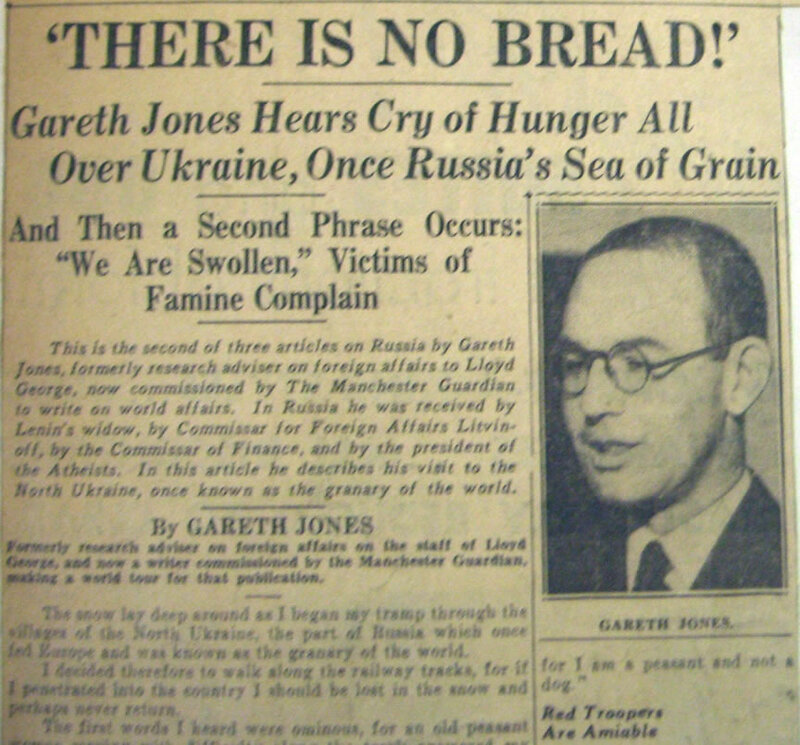 His diaries, and the subsequent newspaper reports in the Manchester Guardian and New York Evening Post, made him the first Western journalist to uncover the horror of Holodomor – Stalin’s devastating “manmade famine” in the Ukraine during 1932-33, which claimed the lives of millions. became a marked man who would eventually pay the ultimate price for the success and potency of his work. the Soviet secret police, but he was a teetotal, devout Welsh non-conformist and for him, the truth mattered. 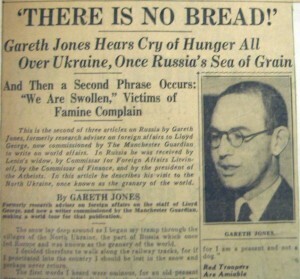 Jones’ exposé of the Soviet government’s persecution of its own people eventually led to him being banned from Russia altogether in 1933. It proved a decisive moment; in less than two years, he was dead. fabricated them. He died knowing his integrity had been undermined. what was to come, Goebbels told Jones the Nazis would never surrender their stranglehold on power. being true.” The circumstances of Jones’ death are still shrouded in mystery. 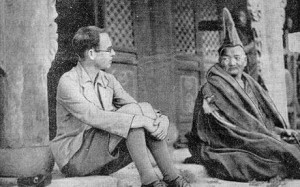 1935 he was kidnapped while travelling with a German journalist “friend” named Herbert Mueller in Mongolia. Both Mueller and Jones were taken by a group of Chinese bandits, but Mueller was released unharmed two days afterwards. It has since emerged that Mueller was a Communist spy employed by Soviet agents supplying arms for Chairman Mao’s Long March in 1934-36.
death. That he died because of what he knew seems beyond doubt. 1940s. The fact that he never realised his full potential still leaves a bitter taste. to the Ukrainian people in exposing Holodomor. and arguably the finest journalist it’s ever produced, must surely come soon. We dine together and talk. Charming man; dark brown eyes. Iberian from Rhineland; very narrow head; like South Wales Miner; high brow. He talks of past days, as the days, the days of idealism. materials; but we want to stretch towards the East. We want to take the people away from the towns and settle them on the land. To do this we must control the Baltic. That’s why we have (?) the Danzstreuzer [Danzig Corridor in German?] PanzeKreuger We must have a strong Baltic fleet. Macht and that Poland will realise that it will be better to give back the Corridor. powder-barrel. Unless the causes? Are removed it will blow up. We are not so keen on colonies. The mistake of past… was to concentrate on Wetwigtschaften. Germany has two alternatives: Land or Sea Army or fleet East or West Europe or World Cannot do both. Mistake of pre-war days was to try and do both. land. Great mistake to concentrate on export. The days of export are over. During the war the German propaganda was abominable; it was in the heads of people were bourgeois and had no connection with the people. A good propagandist must know the roots. watch next week, we’ll flood Berlin with propaganda. I wonder if Goebbels takes things serious; or is it more self-expressionism; love of fights – arguments. Argumentation. Can imagine him in discussions in South Wales. It is too late to build up an international society. The chance is lost and will never come again. Goebbels and I drive to station. He says: “We’ll stick to power. Nothing will get us out. From now on there’ll only be Nazi Ministers. Hitler and Goebbels only have a few striking words (Stuhworte) and practically never prepare. Goebbels: “I prepare a speech in 10 minutes. Just a structure. I speak on. “? I spoke at Mayakowsty’s ?? ?grave, it was only a minute or two before that I thought what I’d say. I thought that I’d describe his life and at each step in life say “and now he lies[?] there? c.f Julius Caesar. Feel at home with Goebbels. Hitler hunches himself up a little. (Interview with Nigel Linsan Colley first published in The Big Issue in November 2009. All other materials courtesy of Gareth Jones’ estate).